MIAMI BEACH,WATERFRONT VILLA CAPRI,PRIVATE ISLAND,POOL, PARKING,BEACH.This 3000 Square Feet (280m2) Villa is located in a gated community in Eastern Shores near Miami Beach. This is a LEGAL SHORT TERM RENTAL Villa with City & State Licenses. This Miami Vacation Rentals Villa, Villa Capri, with his 4 bedrooms, 3 bathrooms, and heated pool is the place to have good time and relax with all the family or friends. This Villa with luminous rooms, recent features, offers a direct access to the pool by the kitchen, the dining room or the living room. This amazing Miami Beach Villa, Villa Capri, is walking distance from the Beach, Groceries, Restaurants, Movie Theater...You can also take the bus to Bal Harbor, Aventura Mall, and Village at Gulfstream Park in Hallandale with a grand Casino. This is an ideal Miami Beach waterfront house for Vacation Rental. This 3000 Square Feet (280 m2) Villa is located in a gated community in Eastern Shores near Miami Beach. This is a Legal Short Term Rental Villa (City & State Licenses). 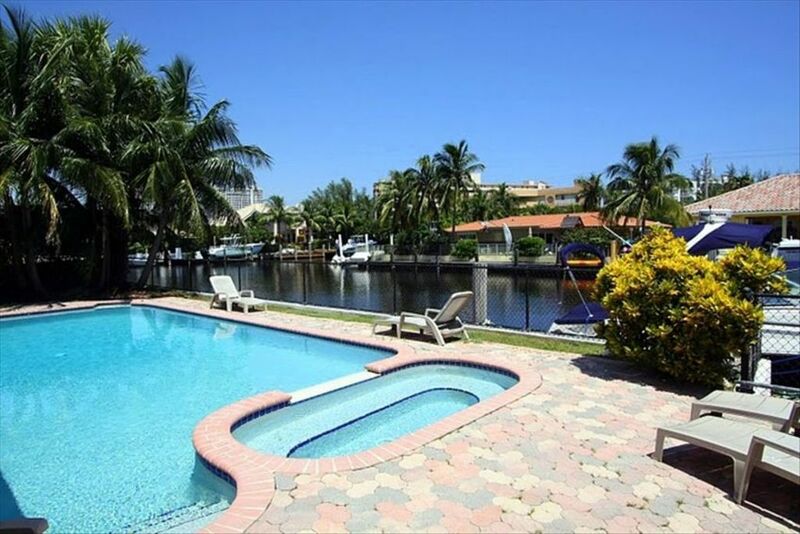 This Miami Vacation Rentals Villa with his 4 bedrooms, 3 bathrooms, heated pool and a dock boat (80 feet) is the place to have good time and relax with all the family or friends. The front of the villa is nice with a lot of vegetation, a real house where the good life is. In the Villa, you find a large and luminous dining room with table and chairs recently changed, and directly open to the kitchen. You can also access directly to the pool and garden by the dining room. The kitchen, is full equipped (fridge, freezer, dishwasher, coffee, microwave, electric cooktop, oven and toaster), made with luxurious wood, and offers a nice view on the pool and canal. The kitchen has a direct access to the pool and is open to the dining room and the living room. The huge and bright living room has 3 leather sofas, a big TV (40-inch) as a direct access to the terrace and the pool by his big sliding window. The nice terrace, with palm tree and vegetation, features chairs, table, lounge chairs and a big heated pool to enjoy the Florida sun and the nice canal view. This Villa is the place to relax and have a good time during your vacation in Miami. The master bedroom has a King size bed, a big TV, a dressing room and a marble bathroom (with shower). The second bedroom features a King size bed, a dressing and a nice bathroom, and also offers a beautiful view on the pool. The third bedroom is smart and bright, with a nice King size bed and a Plasma TV. The fourth bedroom is bright as the precedent and has a Queen size bed. The both bedrooms share a bathroom, which is located in the hallway. This Miami Vacation Rentals Villa will offer you the best for you to have calm and luxury for your vacation in Miami Beach. To make your stay more comfortable, the house will be equipped with everything you need even a scale to be able to weigh your suitcase for your trip back. We do not think that anything is missing in the house but if this is the case then just let us know what you would like or what it is missing for your comfort and we will bring it to you. We also offer for free cribs and high chairs for babies so you do not need to bring anything heavy with you. This vacation home is fully furnished & completely equipped with linens and towels for your convenience. We offer free internet access and unlimited calls (to landline phones) within the U.S.
Aventura Mall is anchored by Nordstrom, Bloomingdale's, Macy's, Macy's Men Home Furniture, JCPenney and Sears, and offers South Florida visitors a compelling selection of international and national retailers including Abercrombie & Fitch, Boss Hugo Boss, Coach, Diesel, Michal Negrin, Miss Sixty, Movado, Oilily, and Puma. Aventura Mall welcomes travelers and tour groups from around the world. Whether you are visiting South Florida for business or pleasure, the Mall offers high-end fashion and dining. There are over 2.1 million square feet of shopping and entertainment at Sawgrass Mills. Sawgrass Mills is conveniently located at the crossroads of West Sunrise Blvd. and Flamingo Road just 15 miles from the Fort Lauderdale International Airport and 30 miles from the Miami International Airport. The Bal Harbour Shops, apart from boasting of a VERY extensive collection of luxury items for their clientele, is also the pride of Florida because it is a family-owned mall – as most of us must know, very few malls in America are currently owned by a family business and are instead run by rather sterile corporations. The fact that this establishment has managed to maintain its appeal and integrity while somehow growing to be the leading luxury shopping center in Florida is something to be admired, of course. Currently, Bal Harbour Shops is considered by many as one of the most profitable shops in America, and is a favorite place to visit in Bal Harbour. Villa Capri is well equipped for all your vacation needs.Enjoy your Vacation and thank you very much for choosing Villa Acapulco for your Vacation. Nice place for a week ! Close to attractions and b.c the beach. No washcloths or hand towel. We will take your comments into consideration and make sure to review everything in the property. Comfortable and spacious home in a great area. As others have mentioned in past reviews, Villa Capri definitely has a few “quirks” but overall the property and the experience was great. It served our family well during our trip, and I would recommend the property to those needing a comfortable vacation spot on the water for a good value. I hate leaving bad reviews but I don’t feel the price or listing reflects the state of the home. Positives-pool, canal with deep water access, large home, clean. Negatives-home is not “well stocked” as advertised. There wasn’t one cleaning product when we arrived (they were kind enough to send some over after we asked), but not even a salt or pepper shaker or soap to wash your hands was to be found. -Bare minimum for furniture-cheap outdoor furniture, no rugs and hardly a curtain so sound travels terribly and is very echoey throughout the home. A few rugs and better curtains would be a huge improvement for noise and comfort. -Many broken or worn item around the home. Do not recommend for kids as there are lots of areas that need repair (rusty nails protruding on the side gate, parts of the pool with broken brick or concrete, uneven bricks on the steps to the dock, dock has pieces of wood missing so be cautious if pulling your boat up). Things like the ice maker and oven vent were also broken and washer/dryer only worked 50% of the time. -Tons of ants around the pool area and cockroaches in the bathroom drains (I know cockroaches can be normal around these parts but there were a lot). The rental company did send someone over when we had issues with the big things so they are responsive but we were disappointed in the overall state of the home. We enjoyed having the pool and being a 5-10 min drive to the beach, but for how much you are paying, they really need to do some repairs/upgrades and have more things stocked in the home. I would suggest looking elsewhere unfortunately. Wonderful home, has everything you need to comfortably live for the duration of your stay. Home owners are very laid back and only come around when you need something. Will definitely be booking again next year. My friends, family and I had an amazing time, had a couple issues with my bank for payments but they went out of their way to help me and make sure that we had what we need it. Thank you so much!! Definitely will recommend this house and hopefully we’ll be back soon. The Villa Capri is located in the prestigious Neighborhood of Eastern Shores.